A vacation in Voss Municipality offers great opportunities for bird-watchers--more than 155 avian species live in the region, including the great egret and the European hobby. 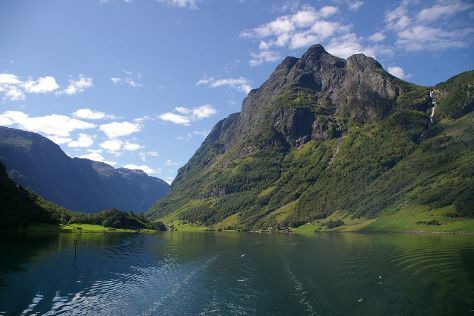 Start off your visit on the 5th (Sat): snap pictures at Hardanger Bridge, admire the sheer force of Tvindefossen, and then contemplate the waterfront views at Naeroyfjord. Keep things going the next day: relax and float downstream with a rafting and tubing tour, take the plunge with a skydiving experience, then see human ingenuity at work at Sysendammen, and finally identify plant and animal life at Hardangervidda Natursenter Eidfjord. For more things to do, other places to visit, traveler tips, and tourist information, go to the Voss Municipality itinerary maker. Use the Route module to find suitable travel options from Palm Bay, USA to Voss Municipality. The time zone difference when traveling from Palm Bay to Voss Municipality is 6 hours. In November, Voss Municipality is colder than Palm Bay - with highs of 38°F and lows of 32°F. Finish your sightseeing early on the 6th (Sun) to allow enough time to travel back home.